Addressing environmental challenges and integrating Nature-based Solutions (NbS) in coastal settlements can provide social and economic benefits as well as strengthen resilience in Pacific islands. In Ocean Cities at the nexus of ocean health, climate change, and urban development, large infrastructure and service delivery gaps are holding back sustainable growth, causing environmental degradation and inequality in the region. These issues must be addressed for cities to grow in an equitable and environmentally responsible manner in small island developing States. Ocean Cities of the Pacific face many interconnected challenges and threats: increased pressure on natural resources through unchecked urbanization, inadequate environmental planning capacities, lack of inclusiveness in policy planning and the ongoing destruction of coastal and marine ecosystems through unsustainable land use and coastal development, overfishing, pollution, and climate change-induced natural disasters. In Fiji alone, annual losses due to extreme weather events could reach 6.5 percent of the country’s gross domestic product by 2050. Challenges have been exacerbated by land tenure issues and lack of land resources, placing additional pressure on limited natural resources in rapidly growing Ocean Cities of the region. At the same time, there are existing opportunities to meet challenges in Ocean Cities using NbS that are ocean friendly, climate resilient and can achieve multiple benefits. 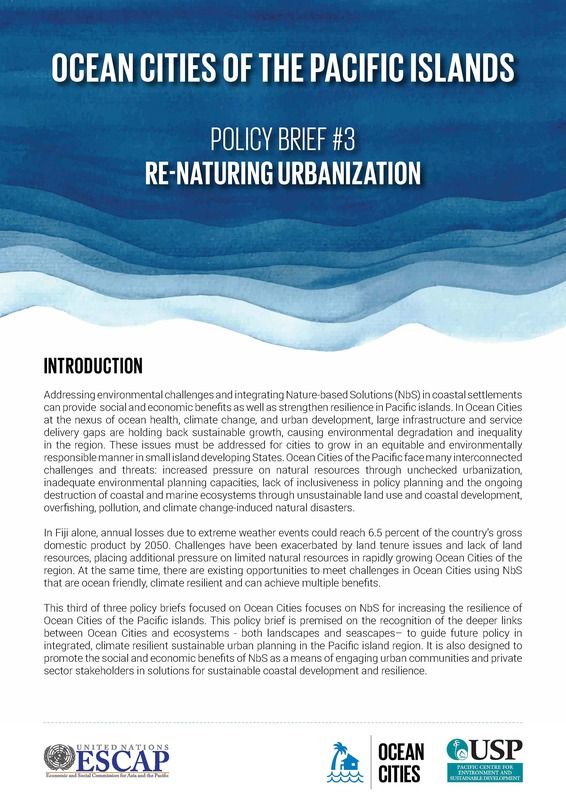 This third of three policy briefs focused on Ocean Cities focuses on NbS for increasing the resilience of Ocean Cities of the Pacific islands. This policy brief is premised on the recognition of the deeper links between Ocean Cities and ecosystems - both landscapes and seascapes– to guide future policy in integrated, climate resilient sustainable urban planning in the Pacific island region. It is also designed to promote the social and economic benefits of NbS as a means of engaging urban communities and private sector stakeholders in solutions for sustainable coastal development and resilience.